FINAL LIST! Monster Drawing Rally 5: More Artists, More Art, Same Entertaining Format. Midway Contemporary Art’s Monster Drawing Rally returns! In celebration of its 5th year, the very popular annual fundraiser/community event is moving locations to the Grain Belt Bottling House at 79 13th Ave. NE Minneapolis on Saturday, December 15th from 6-10pm. The new location will accommodate nearly twice as many artists as prior years, meaning more artwork and more space to socialize and scout the next acquisition to your personal collection. For the last four years The Monster Drawing Rally has given artists living in the Twin Cities the opportunity to support the programming at Midway Contemporary Art while simultaneously gaining exposure within the community. For this years event over 80 artists will generously donate their time and talent by drawing live at the event during three one-hour rounds beginning at 6pm, 7pm and 8pm. Admission to the event is Free. Each of their drawings is available immediately for sale (first come/ first serve) for a flat price of $35. The casual atmosphere lets visitors watch the art making process while keeping a close eye on the walls filled with finished drawings available for purchase. Even if you are not in the market for art, its still an unique opportunity to interact and watch local artists at work. Many of you know the format, but for any first-time Monster Drawing Rally attendees here are some tips to make your evening a success. 1. 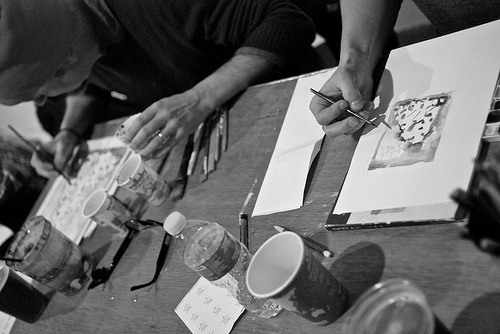 There are three one-hour rounds with approximately 25 or so local artists drawing for each shift. We will be releasing the full list of artists on this blog over the course of the week. Check back often and see if your favorite local artist will be participating. 2. This is a rare opportunity to watch and interact with an artist as they are working. I have personally participated as an artist ever year of the event, I can say it is an interesting experience from the other side of the table as well. No hiding your miscues with an attentive audience and there is a wonderful satisfaction is a meeting someone that has excitedly purchased one of your drawings. 4. At $35 you WILL find something you want to buy. 5. When you purchase the piece you will also get the contact information for the artist. If you don’t get a chance to meet them or talk to them at the event…contact them and let them know you bought their work. Artist love to meet people who invested in their work….we really do. 6. This is one of the most community driven and artistic centric fundraisers in the city and one of the most popular. This is also an event the rewards people that show up early and stay throughout…so plan accordingly. Here is the full list of participating artists and their websites so you can do some pre-rally scouting.